India, China and Sri Lanka are quantitatively as well as qualitatively the most important countries for tea production. India is the biggest country of tea production. The different climate circumstances of the various growing areas are significant for the diversity of tea. The soil and weather conditions enables the tea to unfold various flavours, colours, and intensites. India is the biggest tea producer with more than 900,000 tons of tea each year. That are 27 % of the world production; however most of the tea is being consumed by the Indians themselves. 180,000 tons of tea is exported to the main customers Great Britain, the United Arab Emirates, Poland, Saudi Arabia, and Germany. China is the country that offers the largest tea variety and extraordinary specialities. It is the only country that produces jasmine-tea, rose-tea and litchi-tea. Knowledge about tea and bone china comes from China. The second largest tea supplier worldwide exports 286,000 tons out of 870,000 tons of tea that grows on 1,2 million hectare. The most important customers are the Soviet Union, Morocco, Japan and Hong Kong. Germany satisfies its needs of tea with 19%. 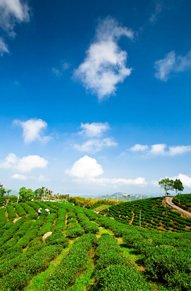 The island state Sri Lanka was called Ceylon until 1972 and is the third largest country for tea production worldwide. The export of 300,000 tons of tea out of totally 310,000 tons is a main source of income of the island. Tea has been produced and grown on 230,000 hectare for 140 years.